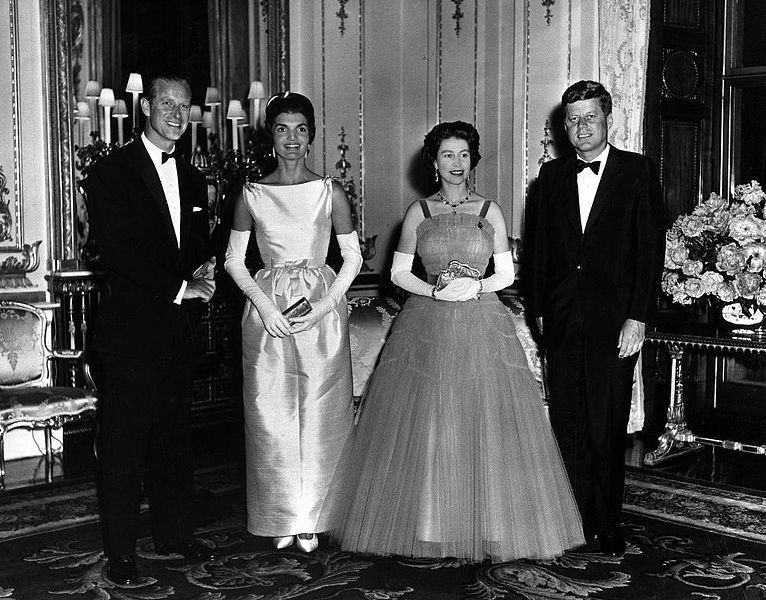 Queen Elizabeth II made her first ever visit as a reigning sovereign to the United States in October 1957. She was warmly welcomed in New York with the traditional ticker-tape afforded to a head of state of her stature. Massive crowd turned out along the streets of New York as Her Majesty’s open-topped limousine slowly progressed along Broadway towards City Hall. Her visit included addressing the United Nations General Assembly where she received a standing ovation. 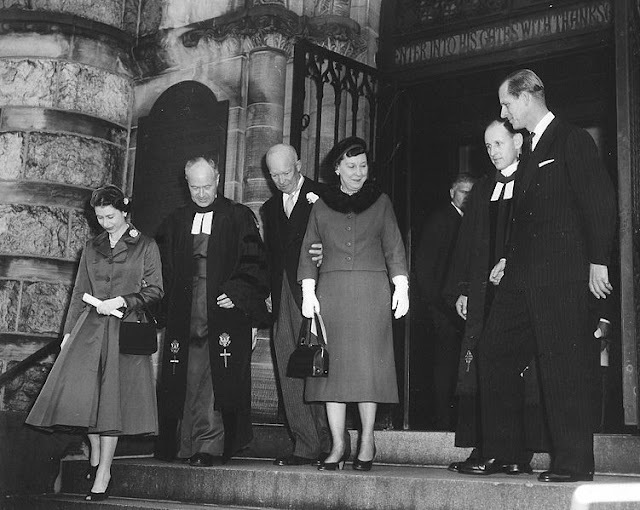 In the picture above, US President Dwight Eisenhower and First Lady Mamie Eisenhower with Queen Elizabeth II and Prince Philip on a visit to National Presbyterian Church in 1957. With them were Dr. Elson and Associate Minister John Edwards and Prince Philip. The state visit of US President John F. Kennedy and his first lady, Jacqueline, was well-received both by the crowd and by the media. In fact, during his stint in the White House the presidential couple’s popularity eclipsed those of any other US presidential couples, save for the Obamas. 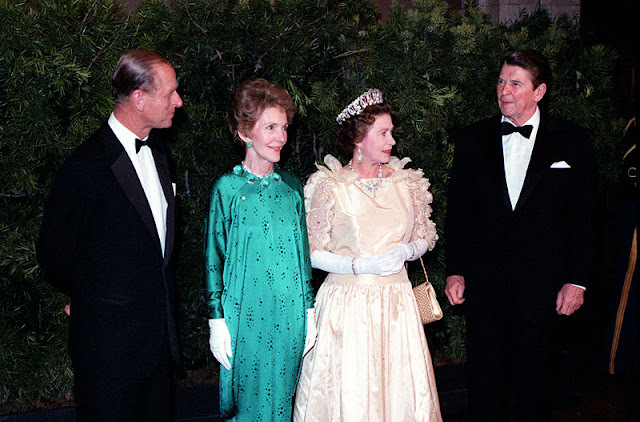 During the dinner with the Queen and Prince Philip at Buckingham Palace, the press and fashion insiders debated whether or not Mrs. Kennedy’s Chez Ninon dress upstaged Her Majesty’s Norman Hartnell evening gown. After JFK was assassinated in 1963, Queen Elizabeth II failed to attend the funeral because she was pregnant with Prince Edward. In honor of President John F. Kennedy, who was assassinated in 1963, a British memorial, consisting of a garden and a Portlant memorial stone tablet where a quote from the late president was inscribed was dedicated jointly by Queen Elizabeth II and former First Lady Jacqueline Kennedy at Windsor. In 1970, President Richard Nixon and First Lady Pat Nixon visited the United States. 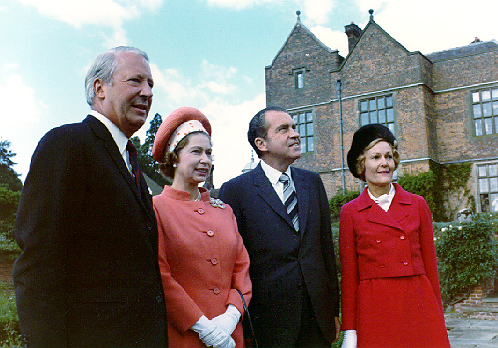 In this picture, the Queen is seen with Prime Minister Edward Heath, and President and First Nixon. 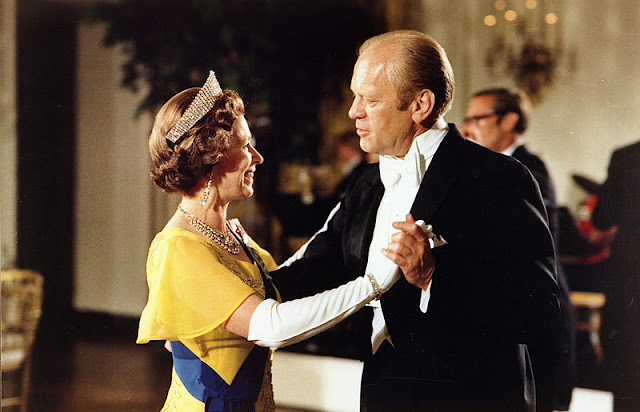 Queen Elizabeth II and Prince Philip once again headed to the United States in 1976 to join the Americans in during the Bicentennial celebration of the Declaration of Independence. They were welcomed by US President Gerald Ford and his wife, Betty. The tour brought the royal couple to Philadelphia, Virginia, New York, Connecticut, Massachusetts, and Washington, D.C., on board the Royal Yacht Britannia. In June 1982, US President Ronald Reagan visited Britain where he addressed Parliament. 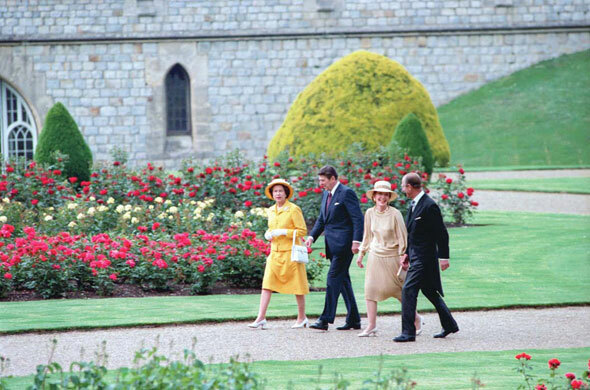 A banquet in honor of President Reagan and his wife, Nancy, was hosted by the Queen at Windsor Castle. The Queen reciprocated the visited and from February until March 1983, Queen Elizabeth II proceeded to the US after a tour of Mexico. She toured the West Coast on board Britannia. 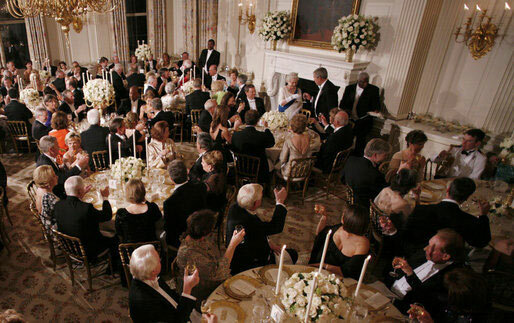 A glittering dinner was hosted by President Reagan in Sound Stage 9 at 20th Century Fox studios in Hollywood, attended by such legends as Fred Astaire, Michael Caine, and George Burns. 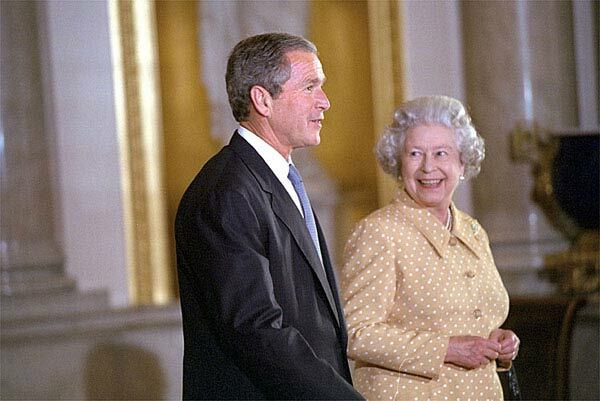 The Queen and President Bush in Buckingham Palace. Image: The White House Archives. In 2001, President George W. Bush visited U.K. In the picture, Her Majesty is seen walking with the President through Buckingham Palace. White House photo by Eric Draper. U.S. Department of State Archive. 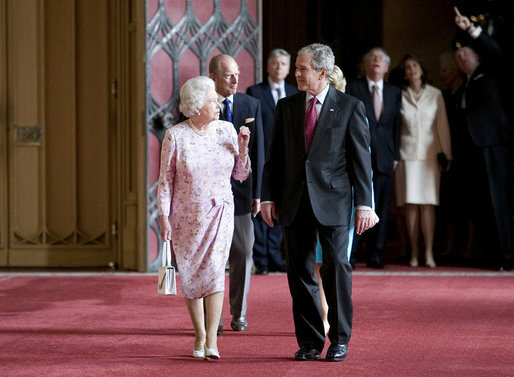 In 2007, Queen Elizabeth II returned to the U.S. for another visit. 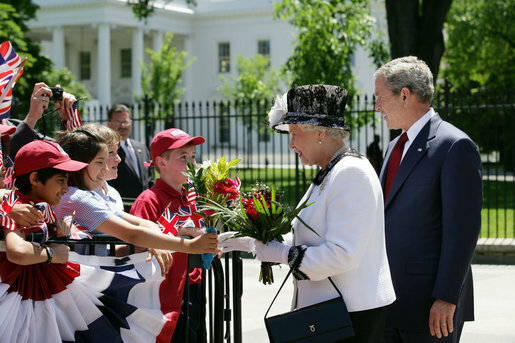 Her Majesty and President Bush are greeted by children outside the White House. Image: White House Archives. President and Mrs. Bush with The Queen and Prince Philip during the State Dinner held in honor of Her Majesty and His Royal Highness. Image: White House Archives. 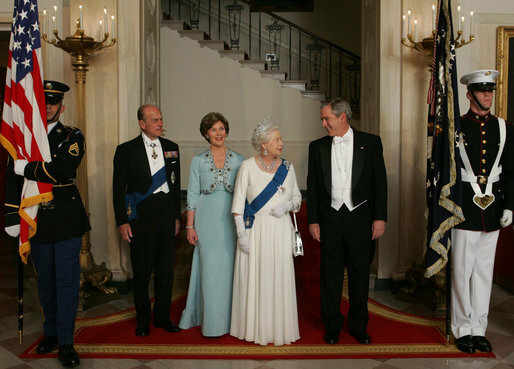 During her visit to the U.S. in 2007, Queen Elizabeth II had a full schedule, which included meeting and greeting children, attending state dinner and luncheons, among others. In 2008, President George W. Bush and Laura Bush made a second visit to the U.K. In the picture, Queen Elizabeth II and the Duke of Edinburgh were seen with the presidential couple in St. George's Hall at Windsor Castle in Windsor. 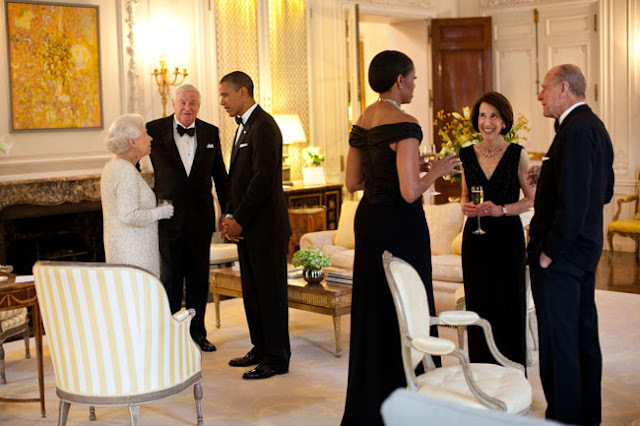 President and Mrs. Obama with Queen Elizabeth II, Prince Philip, Ambassador and Mrs. Susman before a dinner in the Queen's honor at Winfield House in London in 2011. Image: Pete Souza. In 2009, President Barack Obama and First Lady Michelle Obama went to the U.K. and are welcomed by Her Majesty Queen Elizabeth II to Buckingham Palace in London, April 1, 2009. White House. In May 2011, President Barack Obama paid another two-day state visit to Britain. Queen Elizabeth II hosted a state banquet in his honor at Buckingham Palace. Celebrities such as Tom Hanks and Helena Bonham Carter, as well as, director Tim Burton also attended the dinner. In July 2018, President Donald Trump and his wife, First Lady Melania Trump, paid an official visit to the U.K. They were welcomed by the 92-year-old Queen at Windsor Castle, where the two heads of state made a ceremonial inspection of the guard. The U.S. president was seen taking an abrupt halt through the inspection until Queen Elizabeth quickly told him where the go and then, Her Majesty was forced to walk around him. The couple were then invited to have with the Queen. 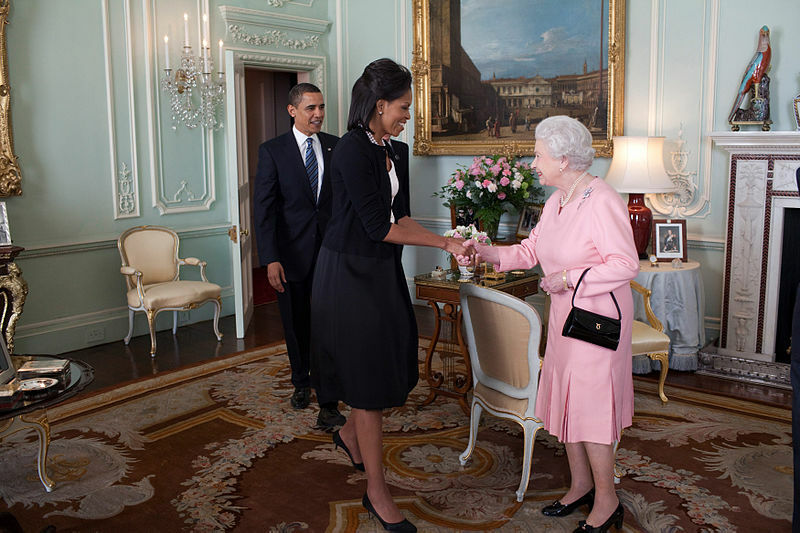 The U.S. president had earlier praised the Queen for being a "tremendous woman." Did you know you can shorten your links with AdFly and earn money for every click on your shortened urls.